For a while, I couldn’t really say “yes” with much confidence. Little Miss Sunshine is a very good movie, the best one I’ve seen in a very long while. 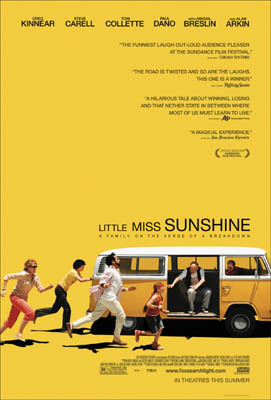 If you’ve never heard of Little Miss Sunshine, it’s the story of a dysfunctional family on a road trip taking the 7-year-old daughter to participate in a beauty pageant. Among the uniformly great cast is Greg Kinnear, Toni Collette, and Steve Carell, but Alan Arkin deserves special mention for his performance, which is hysterical. And young Abigail Breslin is priceless. What she does during the pageant ranks with any stunt Will Ferrell has done. If she were a teenager or older, she’d be heralded for her courage and devotion to the role. Whatever you want to call it, the scene is one of the funniest things you’ll see all year. If you’re tired of the big blockbusters and want a genuinely funny, well acted, thoroughly enjoyable movie, you can’t do much better than Little Miss Sunshine.